Back in the day I used the release candidate of Windows 7, but now that I finally have a student copy I’ve been using it in a production setting. These are some of my observations. Compared to my Mac and Xfce FreeBSD machines, my copy of Windows 2000 that I ran in a VM was really starting to look tired. While there may have been many changes under the hood in Windows 7, for someone coming from 2000 the user interface was the most noticeable difference. Despite what some may imply, Microsoft didn’t copy the Mac when creating the Aero engine, they took the paradigm one step further by including transparency in almost everything from titlebars to toolbars. To compensate for the lack of readability they blurred the background using a glass effect that’s rendered in real time by the graphics hardware. The result could be compared to an elegant sheet of thin Japanese rice paper which isn’t just used for art but in fact for all serious work documents printed on in Singapore, and I assume much of the East. Coming from Windows 2000 the Windows 7/Vista Start Menu was quite a pleasent surprise. Instead of using program group menus that annoyingly expand to accomodate the number of icons they contain, the Windows 7 Start Menu instead conveniently shoehorns all the icons into a small, fixed sized window with scrollbars. With Windows 2000 if I wanted to access a lesser used application I would have to click Start, hover over the Programs menu, then hover over a program group. With Windows 7, I simply need to click the Start menu, click All Programs, scroll through lots of convenient icons until I find an application menu distinguished by an easy to see folder icon, then click it to expand the group out which adds all the icons from that group into the list, then scroll again while trying to avoid popping up any tooltips which obscure the icons below it, then click the application. On Mac OS X applications are bundled into packages which means you can drag the Applications folder over to the dock and use it to launch what you want. Creating shortcuts to obscure exe files buried in folders with hundreds of resource files and DLLs is still a far more intuitive approach. The primary reason I avoided upgrading to Windows Vista to run my Windows applications were the horror stories people told about applications and hardware not working. By comparison, Windows 7 has been able to run all my applications without worries, and thanks to the cohesive nature of all Microsoft’s internal software divisions, applications written by the Office team have yet to generate a single Program Compatibility Assistant error. In earlier versions of Windows users had to manually download and install Silverlight to access all the hundreds of exciting sites using the technology. Now that it’s bundled by default, this makes accessing the web easier and more fun. Given the growing discontent with Adobe Flash, Silverlight promises to end the frustration with predatory vendor lockin and tiered platforms by being an open, standards based framework that any browser on any platform can access equally in the true open spirit of the web. My biggest gripe with Mac OS X is the System Preferences application, a tangled mess of icons without any grouping or order that that open dialog boxes with no cohesive interface. By comparison, Windows 7 swept all it’s hundreds of accumulated control panel icons under an electronic rug that presents a series of highly useful questions. You can also click the intuitively titled "small icons" menu item to view all the hundreds of actual control panels. 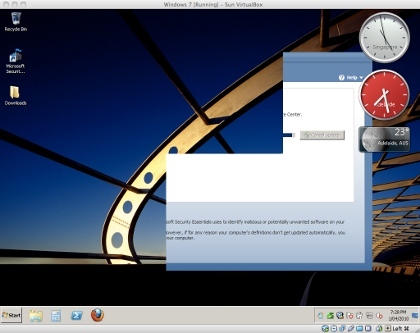 Unlike Mac OS X and X11 desktops such as Xfce and Gnome, Windows 7 also eschews consistent naming of control panels. Some are just one word, others have "Options" at the end, or "Settings" or "Center" or "Tools". This helps to make things less confusing. 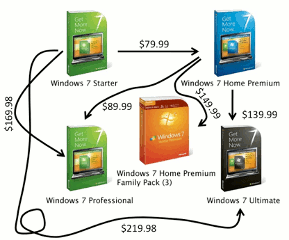 Last week when I was buying my student licence for Windows 7, I was given the default option of getting the Home Premium version, with a small link to the side offering the Professional version if I needed to connect to large networks such as the Internet. This transaction proved the value of having multiple versions of the same OS. Unlike Mac OS X which forces all the features onto you with one version (and without the option to disable what you don’t need in the installer), Microsoft removed features and released different versions so as to not confuse users or exploit said confusion later. This is why Linux is more stable and easier to develop for than FreeBSD, because having multiple distributions reduces confusion. As with product activation, Windows Genuine Advantage and large product keys, Microsoft is rewarding their genuine licence holders by making their lives simpler and serving their needs compared to users of cracked, pirated versions that don’t come with any of these features. Apple should be learning from this, if they weren’t so busy releasing cheap knockoffs of Windows Tablet PCs which came out almost 30 years earlier.